Original text and images of the 1987 BMX Schwinn sales brochure. Frame - Schwinn, 4130 Bi-oval chrome - moly freestyle design with step 1 top tube platform, step 2 rear integral platform and step 3 down tube platform. Fork - Schwinn, 4130 chrome - moly with intefral front standers. Handlebar - Schwinn, low rider 4130 chrome - moly free style design. Stem - ACS Parts modification and rotor rear mechanism. Brakes - Dia - compe MX883 front and MX750 center-pull with tech 6 levers with parking brake and lined casing. Crank - Sakae cr-mo lite, 175mm, chrome-moly, with 43T alloy sprocket, quick change alloy disc. Sprocket - SunTour EZ-off, 16T. Pedals - Plastic, bear trap with chrome-moly axle. Rims / Hubs - Yo! 48 1/2, Araya 7X, 20" X 1.75", 48H alloy with Yo! L.E, 48H alloy hubs with chrome - moly axle. Tires - Free style, skinwall, 20" x 1.75". Saddle - Predator Yo! Rock N'Roll (patent pending) roller design. Seat Post - Schwinn, fluted, chrome-moly, pointed. Accessories - Dice cops, grid tape. Color finish - Neon rose with chrome plated rear triangle, Step 1, Step 3 platforms. Frame - Schwinn, 4130 chrome - moly free style design with step 2 integral rear platform and step 3 down tube platform. Fork - Schwinn, 4130 chrome - moly. Handlebar - Schwinn, low rider 4130 chrome - moly. Stem - ACS Parts modification and rotor. Brakes - Dia - compe MX900 front and MX750 rear with tech 4 levers and lined casing. Crank - Chrome-moly, 175mm with 43T free style disc sprocket. Rims / Hubs - New Predator 20" x 1.75"
Seat Post - Schwinn, fluted, chrome-moly. Color finish - White with chrome plated Tail wild cherry with white tail. Handlebar - Schwinn, low rider, free style design. Stem - ACS Parts modification with rotor rear mechanism. Brakes - Dia - compe FS880 front with tech 4 rear and MX750 levers, lined casing. Crank - Heat treated 175mm with 431 free style disc sprocket. Rims / Hubs - alloy, 7X, 20" x 1.75" S.F. Accessories - Dice cops, plastic disch wheel covers (Disc model only). Color finish - Teal blue, crucial grape (disc model only). 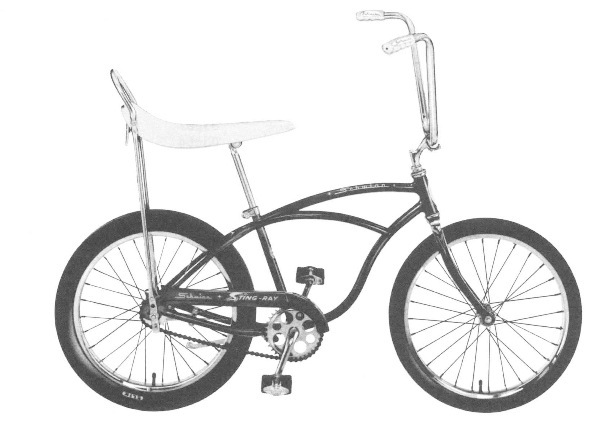 Frame - Patented Schwinn, 4130 chrome-moly tri-oval, tri-caliber tubing. Fork - Schwinn, 4130 chrome - moly, taperred design. Handlebar - Schwinn, chrome moly T-bar, rise: 7 1/2"; Width: 27 1/2". Stem - MX660, Alloy, racing type with Chrome-Moly shaft. Brakes - Dia - compe MX900 rear with tech 4 levers, lined casing. Crank - Chrome-moly 175mm with 43T alloy sprocket, quick change alloy disc. Pedals - Plastic, platform with chrome moly axle. Rims / Hubs - alloy, 7X type, 20" x 1.75" with sakae MH301, sealed mechanism, chrome-moly axle. Tires - Predator skinwall with pro-lite tube, 20" x 1.75". Seat Post - Schwinn, fluted, chrome-moly, layback design. Accessories - Predator nylon top bar pad, alloy valve caps. Color finish - black chrome. Frame - Schwinn design, chrome - moly triangle. Handlebar - Schwinn, "T" bar; Rise: 7 1/2"; Width: 27". Stem - MX550, Alloy with Chrome-Moly shaft. Brakes - Chong Star MX900 front and rear with tech 4 levers, lined casing. Crank - Heat - treated 165 mm with 43T steel sprocket / spider. Rims / Hubs - alloy, 7X type, 20" x 1.75" / S.F. steel. Tires - Predator skinwall, 20" x 1.75". Seat Post - Schwinn, chrome-moly, fluted, layback. Accessories - Predator nylon top bar pad. Color finish - Chrome with black trim, Black chrome with gray trim. Fork - Schwinn, Hi-ten steel. Handlebar - Schwinn, mini low profile, freestyle design. Stem - MX550, Alloy with hollow bolt, chrome moly shaft. Brakes - Chong Star FS890 front with tech 4 levers, line casing, shimano coaster brake. Crank - Heat - treated 165 mm with 43T freestyle disc sprocket. Sprocket - Shimano 16T SunTour 16T (MAG). Rims / Hubs - CMC 7X type, 20" x 1.75" / steel with shimano coaster brake or new predator zytel Mag, 20" x 1.75" with SunTour coaster brake. Tires - Freestyle, 20" x 1.75". Seat Post Clamp - Steel, chrome-plated. Color finish - White with red trim, bebe blue with razzberry trim (MAG). Frame - Schwinn, hi-ten steel, girls style. Rims / Hubs - CMC 7X type, steel, 20" x 1.75" / steel with shimano coaster brake. Tires - Freestyle, Gumwall, 20" x 1.75". Color finish - Ice Mint. Weight - 30 lbs. (Wire). Handlebar - Schwinn Jt BMX chrome plated; Rise: 5" Width: 19". Stem - Double clamp, alloy top. Crank - Forged, 4 1/2" with 36T steel sprocket. Rims / Hubs - CMC 7X type, steel, 20" x 1.75" / steel, S.F with shimano coaster. Tires - Predator Gumwall, 20" x 2.125"
Saddle - Viscount mini aero. Seat Post Clamp - Steel. Frame - Schwinn, low profile, Hi-ten steel. Handlebar - Mini "T" bar, chrome plated; Rise: 4"; Width: 23". Brakes - Shimano coaster brake. Crank - Forged, 4 1/2" with 36T steel. Pedals - Plastic, platform with chrome moly. Rims / Hubs - CMC 7X type, steel, 16" x 2.125" / steel, with shimano coaster. Tires - Predator Gumwall, 16" x 2.125"
Color finish - White and intense blue. Schwinn Bicycle Company - Effective April 16, 1982, Schwinn Approved bicycles, exercises, parts, accessories and other products are warranted to be free from defects in materials and workmanship... no time limit. NOTICE: The user assumes the risk of any personal injuries, damage to or failure of the bicycle and any other losses if Schwinn bicycles are used in any competitive event, including bicycle rating, or in bicycle motorcross, dirt biking or similar activities. DO NOT USE Schwinn bicycles for stunt riding, ramp jumping, acrobatics or similar activities, or with motors as power driven vehicles. This warranty does not cover only personal injuries, damage to or failure of the bicycle, exerciser or other product, or other losses, due to accident, misuse, neglect, abuse, normal wear, improper assembly or improper maintenance. FREE 30-DAY BICYCLE CHECKUP each Schwinn bicycle and exerciser will be full assembled by the Authorized Schwinn Dealer at the time of purchase. Each Schwinn bicycle will be entitled to receive a Free 30-day check up by the same Authorized Schwinn Dealer within the first 30 days of operation... such checkup to include free replacement but not including any repair due to accident, improper use, neglect, abuse, normal wear, improper assembly or improper maintenance. At its option, Schwinn will... without charge... either provide a replacement of or repair any Schwinn or Schwinn Approved part or accessory which is defective under the terms of this warranty. Dealer labor charges in installing replacement parts or accessories are not covered bu this warranty, except for bicycle during the free 30-day checkup, and except for any labor charges due to replacement of a defective frame for bicycles or exercisers within one year of original purchace or retail. Repair or replacement of defective parts or accessories and those dealers charges specified above shall be the sole remedy under this warranty, and in no event shall Schwinn be liable for incidental or consequential damages. Some states do not allow the exclusion or limilation of incidental on consequential damages, so the above limitation or exclusion may not apply to you. This warranty gives you specific legal rights, and you may also have other rights which may vary from state to state. See your Authorized Schwinn Dealer for service or replacement under the Schwinn Limited Warranty, or write to the Comsumer Relations Department at Schwinn. Always wear a protective helmet, gloves, and padded clothing when riding your BMX bicycle.